Anyone who knows me knows I am a huge Jane Austen fan. I reread all 6 of her novels every year and they never grow old to me. She has such witty dialogue, complex characters and builds tension better than any author I know. So, it was with some hesitation I saw Pride and Prejudice and Zombies was being made into a movie. I had heard of the parody book but never read it because it seemed to be making fun of my beloved Austen. I worried the movie would do the same. In fact, I wasn’t going to see the movie but I decided a true Austen fan should give her review and so I took the bullet and went and saw it. And to my surprise I had a pretty good time. 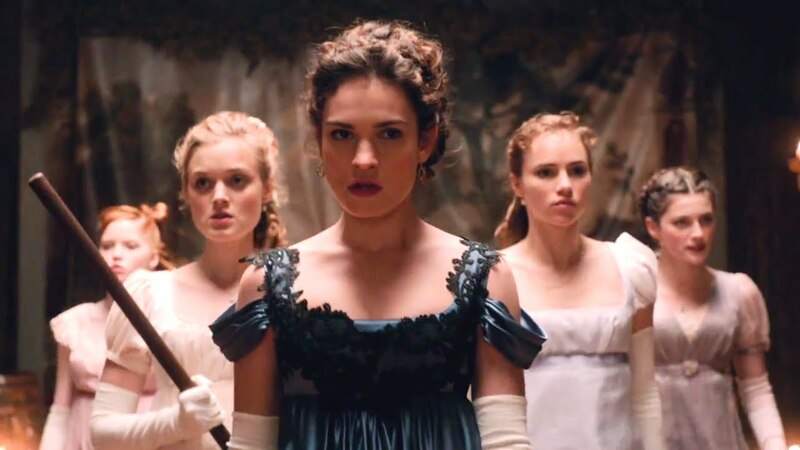 I still wish Pride and Prejudice and Zombies didn’t have the zombies and was just a straight adaptation but for what it was I found it entertaining. In truth, it doesn’t mock Pride and Prejudice or Jane Austen but just has a new spin on the story. The idea behind this version is that zombies came with the plague and the Bennett girls are not only looking for husbands but fierce warriors trained in China. It is all very silly but done with enough panache to be fun. Mr Darcy, Lady Catherine, Mr Bingley are all zombie warriors too. Mr Wickham has shady background and is working with the zombies and Mr Collins is still just plain old Mr Collins. The cast is a lot of fun in this version. Lily James is wonderful as Lizzy. Again I wish she could have just been a regular Lizzy. 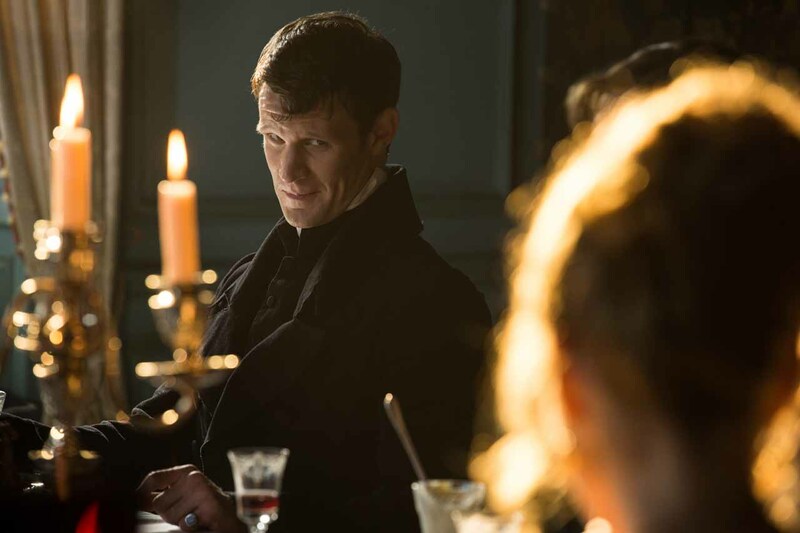 I also LOVED Matt Smith as Mr Collins. He may be my favorite Mr Collins yet on screen. 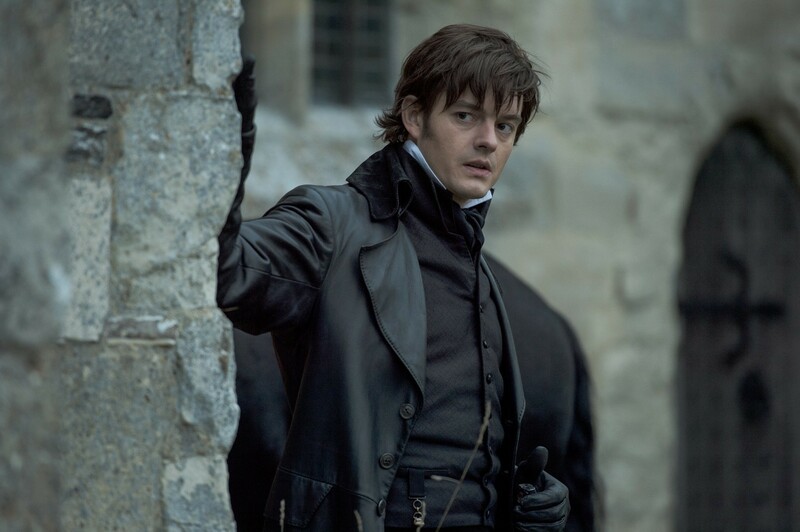 I thought Sam Riley was fine as Mr Darcy but nothing spectacular. He was better at the zombie killing than the Darcyisms. My favorite scene is probably the proposal which has a fighting component that totally worked. 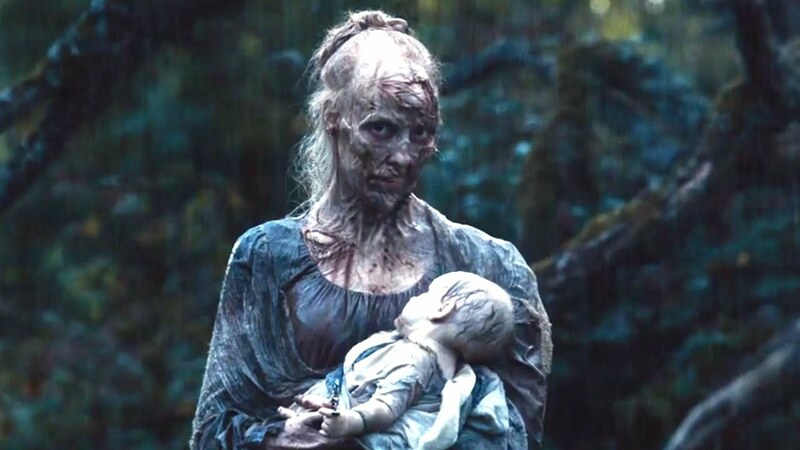 Also the take on Lady Catherine played by Lena Headey was so much fun. There are some problems with the direction of the film. A lot of the action is jerky and darkly shot and the zombies are rather inconsistent. Sometimes they can hold in their zombieness and other times they can’t. There are also one too many martial arts style fight sequences than they probably needed, but they all are done in a spirit of fun. I laughed a lot. Overall, I went into this expecting to hate it but I had a good time. It’s silly but also creative and doesn’t take itself too seriously. I think if you give it a shot you will enjoy it. As far as content much of the violence is off screen with just the sound effects. What you do see is dark or in shadows. I’m pretty squeamish and I was ok with it. I’ve never read any of her books, but have always planned to. I don’t really have an interest in this film. I personally find women who are shown to be beating up and killing people (as the trailer seem to suggest) quite boring, so they don’t entice me personally. Have you ever seen the sort of Hollywood-Bollywood film, ‘Bride and Prejudice’ based on the same story? I have seen Bride and Prejudice and it is very cute and the lead girl is stunning. You should read Jane Austen! She’s brilliant. I haven’t seen Bride and Prejudice in its entirety, but I’ve seen bits of it, mostly the songs, because of the Bollywood aspect of it and my familiarity with Aishwarya Rai. It’s cute. I like all Jane Austen! You should watch it all the way through.